We've got another guest blogger at Jasper Nutrition today! After my last post, which reviewed why athletes should eat more pulses (beans, lentils, chickpeas, and dry peas), I really wanted to bring you some great content about gut health and managing digestive discomforts. But, instead of re-inventing the wheel, I am oh-so pleased to introduce you to Ms. Kathleen Hernder RD, CDE, here to give you her top 5 tips to reduce symptoms of Irritable Bowel Syndrome (IBS). But first, who is she? Even though we might not talk about it, IBS affects about 13-20% of Canadians, according to the Canadian Society of Intestinal Research. That's up to 1 in 5 people in Canada! IBS symptoms include bloating, abdominal pain, and either constipation or diarrhea or a fluctuation between the two. If you think you might have IBS, talk to your doctor to discuss a diagnosis. In its mildest form, IBS can be uncomfortable and embarrassing and at its worst, it can lead to individuals feeling like they can't leave the house because they need to have access to a washroom at all times. This is one of THE most important things to start if you want to improve your symptoms. Include what you eat, how much, your stress levels, and your symptoms and the severity of those symptoms. Often this can help you figure out what is triggering your symptoms, whether it is food or stress-related. This also allows you to objectively see if there are any improvements when you try a strategy to help improve your symptoms (this is why including the severity of your symptoms is so important.) This could be on pen and paper using a template like below or using an app such as Bowelle. 2) Try for more soluble fibre and less insoluble fibre (roughage) and try cooking your vegetables. There are two different types of fibre in our diets: soluble and insoluble. Insoluble fibre is what we typically think of when we think of fibre: the roughage including bran and the skins of vegetables and fruits. This can worsen symptoms in many individuals whereas soluble fibre, which forms a gel (think of jelly- pectin, a soluble fibre causes that gelling) when mixed with water can improve symptoms of IBS, specifically diarrhea is it slows down the movement of food through the digestive tract. Soluble fibre is found in strawberries, oats, chia and flax seeds, citrus fruits, and psyllium. So try backing off on the bran and start adding more foods like oats and chia seeds, especially if you have issues with diarrhea. Cooking vegetables can also be helpful as cooking helps break down the starch they contain, allowing your body to better further break down and absorb the food. I'm not telling you to just eat steamed vegetables because let's face it: that's boring. Try roasting them (my personal favourite), grilling them, sautéing them with a bit of oil and spices, or add them to your soups, stews, pasta sauce.... you get the idea! Whether you are experiencing diarrhea or constipation, ensuring you get enough fluids is very important. For constipation, we know inadequate fluid can be one of the causes and if you have diarrhea, it's important to get back some of the fluids you're losing in your bowel movements. I get the question from clients a lot about how much water they should be drinking so here it is: that 8-9 cups per day includes other fluids! You don't need to drink 9 cups of water per day on top of your coffee, tea, and other beverages. There isn't any evidence on caffeine and IBS symptoms but since caffeine does irritate the stomach and intestines, having excessive amounts probably isn't a good idea. Sticking to a few cups a day as opposed to a pot is probably a good idea and try to get most of your fluid in the form of water. Some studies show that pain and bloating in individuals with IBS is caused by the body not being able to move gas effectively through the intestine so reducing the gas in our gut can be helpful. 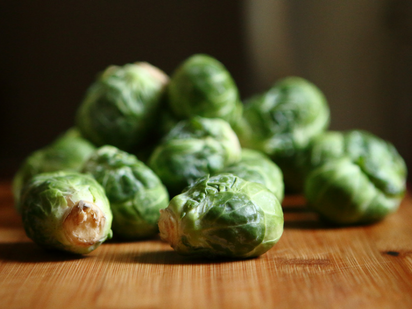 Some foods known to cause gas include cruciferous vegetables like broccoli, brussel sprouts, and cauliflower, garlic and onions, and beans and pulses so try limiting these foods and when you do include them, pay close attention to your symptoms to see if they worsen. [Kirsten here - Head to my last post for some strategies to ward off gas and bloating while enjoying pulses.] It's also a good idea to try to avoid swallowing air: to help with this, try to eat slowly (a good recommendation for everyone- most of us eat too quickly and don't taste or enjoy our food), avoid chewing gum, drinking carbonated beverages, and drinking through a straw. The gut-brain axis is such a fascinating thing- our gut and brains communicate with each other and affect one another! Many individuals with IBS notice their symptoms worsen when they are experiencing stress or anxiety so finding methods to cope with that stress can be very important to manage symptoms. This might include meditation, breathing exercises, or talking to a friend. Everyone has different stress levels and ways of managing it- the key is finding a healthy way of coping with that stress. If you find you are experiencing extreme stress or anxiety, speak to a mental health professional like a psychologist to discuss ways to help manage your stress. Other tips to help with managing IBS symptoms include trying to have regular meals and snacks, reducing alcohol and nicotine as they are gut stimulants, and using peppermint oil. There is some evidence showing that 87-225mg of peppermint oil, two to four times per day can improve abdominal pain in individuals suffering with IBS. Peppermint may interact with certain medications so it is a good idea to speak to a qualified health professional before using peppermint oil. As I said before, these are a good first-line defence but if you are still experiencing symptoms after using these strategies, there are other options such as the low FODMAP diet or probiotics. In my next post, I'm going to discuss what exactly the low FODMAP diet is and how it might help with symptoms. Please note that these tips aren't meant to replace individual medical advice and it is important to speak to your doctor and rule out any other possible causes for your symptoms such as Celiac Disease.